It is up to the next generation of landscape contractors and architects to not only employ sustainable design techniques, but to forefront the education and encouragement of the public on how to be more environmentally responsible. Sustainability describes the endurance of our diverse and productive ecosystem. According to the 1970 National Environmental Policy Act, it is a national goal to create and maintain a state in which humans and nature “can exist in productive harmony, and fulfill the social, economic and other requirements of present and future generations of Americans” [emphasis added]. Since then, many strides have been taking to protect our natural resources to ensure the long-term success of economic activity. Known as sustainable development, it guides us in our decision making to meet human needs while preserving the environment for future generations. 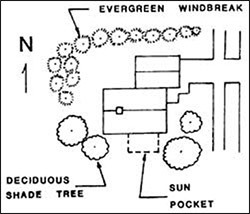 Suggested locations for shade trees, windbreak, and sun pockets. Vegetative cover and proper placement around the house is a key part to the success of sustainable and cost-effective landscaping. According to the US Department of Energy, “carefully positioned tress can save up to 25% of a household’s energy consumption for heating and cooling.” In addition, “the proper placement of only three trees will save an average household between $100 and $250 in energy costs annually” ( Landscaping for Energy Efficiency, http://www.nrel.gov/docs/legosti/old/16632.pdf ). For instance, planting large deciduous trees in an arc encompassing the south, southwest and west sides of your house allows for shade from the harsh afternoon sun in the summer. Mulch is very important to promoting plant health and conserving water while adding curb appeal and transition in your lawn. When applied correctly at a thickness of 2-4 inches, natural mulches such as bark chips keep plant roots cool, prevent soil from crusting, minimize evaporation, reduce weed growth, and minimize erosion, dust and mud. As mulch decomposes it also provides organic nutrients to the soil which helps promote root growth. Effective mulch includes grass clippings, pine straw, corn cobs, river stones, pea gravel, bark chips, leaves, peat moss, wood ashes, sawdust, and more. Research shows that shoppers in well-landscaped business districts are willing to pay more for parking and up to 12% more for goods and services. The net cooling effect of a young, healthy tree is equivalent to 10 room-size air conditions operating 20 hours a day. Trees properly placed around buildings as windbreaks can save up to 25% on winter heating costs. Shade from two large shade trees on the west side of a house and one on the southeast side can save up to 30% of a typical residence’s annual air conditioning costs. Trees reduce noise pollution by absorbing sounds. A belt of trees 98 feet wide and 49 feet tall can reduce highway noise by 6 to 10 decibels. Desk workers with and without views of nature were surveyed. Those without views of nature, when asked about 11 different ailments, claimed 23% more incidence of illness in the prior 6 months. Views of nature reduce the stress response of both body and mind when stressors of urban conditions are present. Symptoms of ADHD in children are relieved after contact with nature. Specifically, ADHD kids are better able to concentrate, complete tasks, and follow directions after playing in natural settings. By adopting xeriscaping techniques into communities, residential dependency on water can be significantly reduced. This has its obvious environmental advantages, but there are its economic benefits, too. According to one study an estimated overall annual savings of $350 could be gained by employing xeriscape principles to a residential landscape. Furthermore, another study claims financial savings can reach up to 50% or more. Because less water is needed in your lawn you do not just save money, but you save time, too. Xeriscaping consists of 7 principles: planning and design, soil analysis, appropriate plant selection, practical turf areas, efficient irrigation, use of mulches, and appropriate maintenance. These xeriscape techniques have proven to help mitigate water use for irrigation while maintaining the aesthetic value of the lawn. For instance, plant selections should include a palette of native plant materials that are drought tolerant. Drought tolerant plants can survive without supplemental watering for more than 2-3 months. A common misconception is that drought tolerant plants are ugly and undesirable. This is not true. Many of the most commonly used plants in South Carolina are considered drought tolerant, such as crape myrtle, wax myrtle, snapdragon, pampas grass, sago palm, poinsettia, southern magnolia, and creeping fig. For a list and descriptions of more drought tolerant plants, please go to Plants Choices. Pervious paving involves the use of porous materials so to allow stormwater to infiltrate into the soil where it can be filtered naturally. The surface material itself can be porous such that water can drain across the entire surface: grass, gravel, porous concrete and porous asphalt. Or, the pervious system can be comprised of impermeable blocks separated by spaces and joints through which water can infiltrate (known as, permeable paving). When installed correctly and maintained properly, pervious surface coverings match the structural and functional attributes of traditional pavement. Pervious paving materials include pervious interlocking concrete paving blocks, concrete grid pavers, perforated brick pavers, and compacted gravel. Pervious paving systems reduce water runoff and increase infiltration for firm surfaces such as patios, driveways, low-traffic roads, access roads, fire lanes, walkways, sidewalks, parking lanes, and overflow parking. For available products please visit the Paver Products section of our website. Permeable paving initially can cost up to four times more than traditional paving (depending on pavers); however, it can cost up to 25% less when considering all construction and drainage costs (California Stormwater BMP Handbook, www.cabmphandbooks.com). Higher installation costs can be off-set by eliminating the need of curbs, gutters, storm drains, underground piping, and large retention ponds. Many communities will in fact reduce stormwater fees with the use of pervious pavement. In addition, pervious systems last longer and are much easier to repair. Proper regular maintenance is important to its longevity and expected life span of 20-50 years. It is recommended to have quarterly vacuuming and/or power washing to prevent sediment build-up. 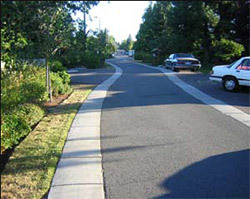 A curbless street with a flush edge allows runoff to sheet flow into an adjacent stormwater system. This curb cut channels water into a vegetated swale, but is too small and clogged with debris. Often times permeable paving is not applicable (i.e., heavy traffic streets) or costs too much to have done. Other ways to manage runoff are various vegetated stormwater systems either within or along side impervious surfaces. These include, but are not limited to vegetative swales, stormwater planters, rain gardens, and green roofs. First, when designing for stormwater management systems it is important to consider how the runoff enters the stormwater structure, especially when dealing with streets and parking lots. Two primary methods of directing runoff into stormwater facilities are through the use of sheet flow and curb cuts. 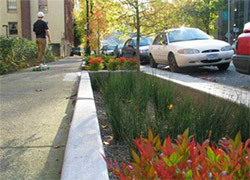 Another method is to have curb cuts along a raised curb that directs runoff into a stormwater system (i.e., stormwater planter). If the curb cut is designed incorrectly, however, sediment build-up can cause it to fail. It is imperative to consider the size and spacing of curb cuts so to allow the water to distribute evenly within the stormwater system. 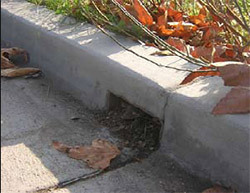 Curb cuts should be at least 18” wide to avoid potential clogging, and regular inspection and clean-out is recommended. low-cost, attractive alternative to traditional ditches. 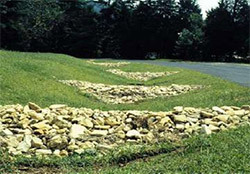 Vegetative swales are graded and engineered landscape features that appear as natural, shallow, open channels that flow through the landscape. The swale is vegetated with grass and flood tolerant, erosion resistant plants. It directs the stormwater runoff slowly, removing pollutants as it infiltrates. A properly designed swale is more efficient in both slowing and cleaning the water than the traditional drainage ditch. Furthermore, they provide a low-cost, low-maintenance option for stormwater management while adding a simple, good-looking element to any site. They are typically used to treat stormwater runoff in areas of five acres or less. Vegetative swales are not recommended in larger, highly urbanized locations unless grouped as series or used as initial treatment for other stormwater management systems. Often times check dams are strategically placed to help slow runoff and cause the water to pond. This helps to improve water quality since the stormwater can infiltrate and filter out sediments. Proper design allows the stormwater ponds to drain within several hours or days. The efficiently linear structure of vegetative swales causes them to be quite popular along highways, residential roadways and common areas in sub-divisions, along property boundaries, and near parking lots. A stormwater planter is a small, contained bioretention system with vegetation that collects and treats stormwater runoff. Bioretention systems gather and filter polluted stormwater naturally with mulch, soil, and plant materials. Common pollutants in the runoff such as bacteria, nitrogen, phosphorous, heavy metals, oil, and grease are retained, degraded, and absorbed. Filtered stormwater then percolates into the ground (as with an infiltration planter) or is released into a stormwater drainage system (as with a flow-through planter). Stormwater planters do not require an excessive amount of space. They add wildlife habitat and aesthetic value to city streets, parking lots, and commercial and residential properties. The planters often include native, hydrophilic (or ‘water-loving’) flowers, grasses, shrubs, and trees. Stormwater planters collect and treat runoff and are nice additions to streetscapes. A rain garden can be 30% - 40% more effective at filtering pollutants than a standard lawn. One of the easiest, most cost-effective ways to help reduce stormwater pollution is constructing rain gardens. 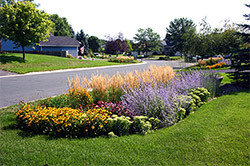 Rain gardens are vegetated impressions that can be used to capture rainwater from your roof, driveway, walkways, nearby streets, parking lots, and compacted lawn areas. They add aesthetic value to your lawn as they slowly filter contaminants from stormwater in a natural manner, sometimes 30% - 40% more efficiently than a standard lawn. The filtration concept is similar to vegetative swales and stormwater planters. However, rain gardens add more aesthetic appeal than swales and the overall construction is more cost efficient than planters. In addition, they require less technical experience to install and do not need permits or heavy machinery. Using native plants helps to reduce the need for fertilizer and attracts local wildlife. It is recommended to integrate a variety of wetland edge vegetation, such as wildflowers, sedges, rushes, ferns, shrubs, and small trees. These plants should tolerate both saturated and dry soil. It is the plants that are vital to the filtration process, since root systems enhance infiltration, encourage soil permeability, provide moisture redistribution, and sustain diverse microbial populations. Usually a rain garden is a component of a garden, but at times the whole garden itself can be an individual rain garden.